One has often heard jokes revolving around two funny but affable characters named Santa Singh and Banta Singh. Taking inspiration from them, director Akashdeep Sabir has made a film by the name of SANTA BANTA PVT LTD. Will the film turn out to be as successful as the 'brand' Santa and Banta or will it become a 'laughing stock' at the box-office, let's analyse. 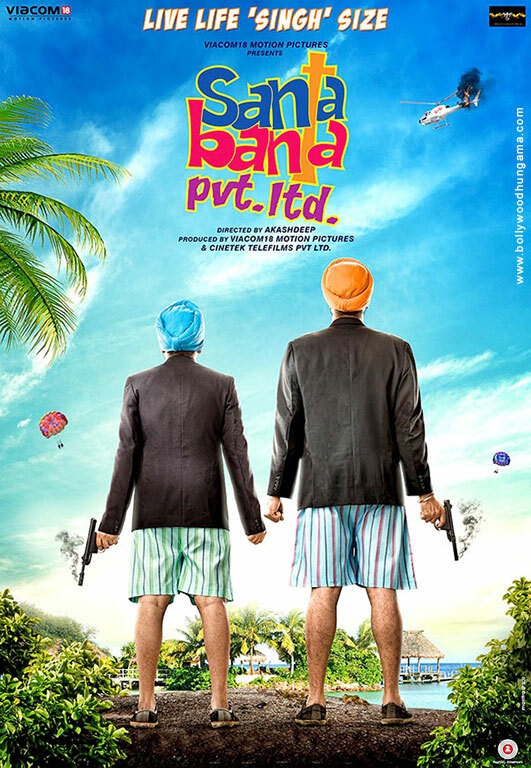 The film starts off with the animated introduction of two best friends viz., Santeshwar Singh Solad aka Santa (Boman Irani) and Banteshwar Singh Bolad aka Banta (Vir Das) leading their crazy but simple lives in Punjab. Meanwhile, in Fiji, the High Commissioner Shankar (Ayub Khan) suddenly gets kidnapped under mysterious circumstances, an incident that causes immense unrest amongst the RAW (Research and Analysis Wing) officials in India as well as in Fiji. The Indian RAW officials, then, plan to send two secret agents Santa and Banta in order to rescues Shankar. When the Indian RAW officer (Vijay Raaz) fails to track down the RAW-assigned Santa and Banta, he gets petrified and scared. That's when he bumps upon the Santa-Banta namesake in the form of Boman Irani and Vir Das. The duo, then, get transported to Fiji with the sole objective of tracing Shankar. When Santa-Banta reach Fiji, what happens after that is beyond their imagination. Out there, they land up meeting Shankar's wife Kareena Roy (Neha Dhupia), Shankar's best friend Sonu Sultan (Ram Kapoor) and also Fiji's RAW agents Cutie (Lisa Haydon) and Akbar Illahabaadi (Sanjay Mishra) and the 'gang' of the Kukri-yielding Nepal's No. 1 Don (Johnny Lever). After their initial hiccups while 'investigating' the case, one fine day Kareena Roy meets Santa and Banta and confesses that she has a strong feeling that her husband has not been kidnapped, but, he has gone underground on his own. In the meantime, Sonu Sultan discovers the truth about Santa and Banta and engages his henchmen to bump them off. Will Santa and Banta, despite not being 'qualified' for the job, be able to crack Shankar's mysterious kidnapping, does Sonu Sultan succeed in bumping the duo off, what happens to Shankar in the end is what forms the rest of the film. Right from the word go, the film's screenplay (Asad Ajmeri - Akashdeep) fails to establish any kind of connect with the audience. And it is this disconnect that actually acts as a roadblock for the film at regular intervals, thus making the film into an extremely boring and lacklustre affair. It won't be wrong to say that the film has (Asad Ajmeri - Pawan Soni) an apology of a script. And it is purely because of this reason, that even the film's screenplay falls absolutely flat on the face. It seems that, with such a kind of screenplay, the audiences are either being tested for their patience levels or are being taken for a royal ride! One really wonders as to how (and under what unavoidable circumstances) the film's script was approved in the first place. In addition to that, one also wonders about the reason as to how could some of the most seasoned actors of Bollywood gave their nod to be a part of this senseless film. Added to all of the aforementioned factors is the insipid direction (Akashdeep) that takes the film nowhere. The director has failed miserably in his task of creating a film that shares its name with the duo (Santa and Banta), who are best known for their senseless but funny jokes. But, with this film, Akashdeep seems to have made a mockery of not just the film, but also the laurels which the characters Santa and Banta enjoy. The film has got a vague first half as much as the senseless second half. The jokes in the film (which are supposed to invoke laughter) fall flat totally and end up irritating (to the core) the audience after a while. With the kind of proceedings that the film exhibits, one does really feel that, rather than taking resort to the jokes/one liners that the movie has, the film's makers could have incorporated jokes/gags from the innumerable Santa-Banta joke bank that is freely available. In totality, SANTA BANTA PVT LTD could be easily termed as one of the worst film of 2016 so far. As for the performances, the film rests totally on the shoulders and antics (in that order) of the duo of Vir Das and Boman Irani. While Vir Das is not new to such kind of quirky and whacked out roles (most of his past films serve testimonies to this), it is the seasoned Boman Irani who manages to maintain some balance in the film. Even though the camaraderie between the two is decent, it's the film's lacklustre and weak script that plays the spoilsport. The film's heroines viz., Neha Dhupia and Lisa Haydon, do their job of providing the glam quotient. The talents of seasoned actors like Johny Lever, Ram Kapoor, Vijay Raaz and Sanjay Mishra, which could have been utilised in a much appropriate manner, land up looking either out spaced or wasted in the film. Nothing, but the hopelessly poor script is the sole reason for this. With absolutely no hummable songs to boast, the film's music (Jaidev Kumar, Jassi Katyal, Nadeem Amjad) is a big let-down. While the film's cinematography (Chirantan Das) is totally average, the film's editing (Nitin Rokade) is nothing great to write about. On the whole, SANTA BANTA PVT LTD. suffers due a weak script. At the box office, it will be a non-starter and its prospects will remain bleak.